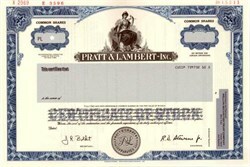 Beautifully engraved specimen certificate from the Pratt & Lambert -Inc. dated 1984. This historic document was printed by the Security-Columbian United States Banknote Corporation and has an ornate border around it with a vignette of an allegorical woman with a shield. This item has the printed signatures of the Company’s Chairman and Secretary and is over 18 years old. Pratt & Lambert has manufactured high quality products since 1849. Products like Cellu-tone and Vitralite established the company's reputation for high quality and have endured the test of time. In the 80's, Pratt & Lambert introduced new acrylic resins in the manufacture of its paint and developed the Accolade line of products - the best interior and exterior finishes available today - rated the #1 interior eggshell finish by Consumer Magazine.